2005/05/01. Sunday. Fine, indeed rather hot. Finally decide to go off to Thetford forest for the afternoon (D wants to go to Parkside, but I refuse to be inside on such a lovely afternoon). Just off down the garden for some reason and check on bees - lots of activity, nothing odd - and think: if there was a swarm, where would it be... and look around... and see a few bees... and spot the large swarm hanging from some brambles. Ah... so, next 3/4 h spent hiving that, MED watching, all goes well. But that just about blows going out, when... phone call from Geoff: his neighbour has bees. Oh just what I needed. And just off to do that when MRs #22 comes over. Fortunately she just has a few in her air vent, so a bit of fly spray clears that. #45 is harder: look around (its an airey, ie voids) and decide that they may be in there, but if so nothing I can do. I feel that this is a bit of a let down by me; otoh she asks if she owes me anything for the service! After that: walk to the rec the back way (even M comes, when kids complain that she never does), picking up JE in the process, E reluctant to walk, meet Hannah and Kesia (and James) there. They (it later transpires) have gone there to meet N, who is away until a bit later, so as well we turned up. Esther turns up to collect JE (with a bike trailer, she can carry JE and Martha on a bike seat, 3 at once! ), N arrives, we stay chatting to James. Back late, returning by back-of-the-church (Meseglise?) way. 2005/05/02. Monday. Again fine, but cooler. To beach! Up 8, out before 9, pick up NP, to beach before 11 (stopping briefly by river/canal after 1h ish). Forecast was marginal: I nearly cancelled: light rain predicted. Day was wonderful: warm and sunny, with a useful rainstorm at 5 to push us off. At the beach, we head as usual for our favourite white beach hut and set up camp. 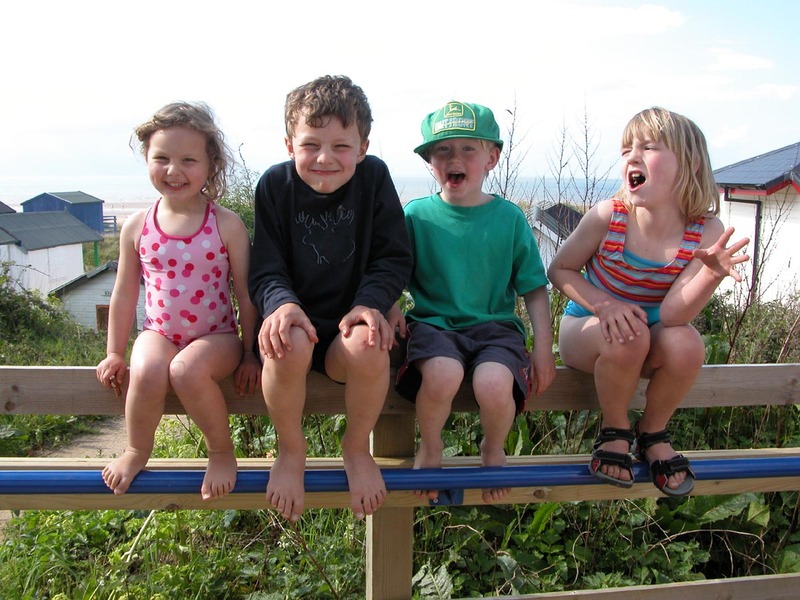 Kids dig and play in the sand, roughly in the obvious pairings. I gunk them up, over their protests. After a bit we go to the cafe and buy new spades, nice metal ones, and have a drink. Back to digging. Light lunch we brought. All the while the weather remains good and I get in some quiet lying in the sun with my hat over my face and listening to their happy cries. At 2 the unthinkable happens: someone comes to claim the beachhut! We move off of course, and they are nice about it, so we just move to the one next door. Later we go down to the sea (just for once its in, so its not a long way). D would like a river to dam but settles for digging channels from the tide pond. N splashes and runs in it... but... gets a shell-cut to her foot which hurts a lot and knocks her out from swimming at all: a bit sad because she was the only one who really did want to swim. I alternate between helping with the diggings and standing back watching and taking the odd photo. After this back to the cafe: buy ice creams for them, cake-and-coffee for me, and a pack of plasters for N's foot. Then back to our encampment for more fun. DN go off to explore, EP are more settled. Fun all round. Start back a bit after 5: awful traffic in OH; turn round and go country; awful again heading for Kings Lynn; loose about 1h. Back nearly 8; drop NP; home; food; baths; bed for children. Discover that the boiler pilot light has gone out and fail to relight it. Hmmm. Find this rather depressing: I could do without this just now. Again, DE have gone to sleep in the spare bedroom. Describe boiler troubles at smoko; Phil Anderson volunteers to come back at lunchtime and have a look (he is known for understanding domestic hot water and gas...). And so he does, and after staring at it for a while he *actually follows the instructions* and it lights. The bit I'd got wrong was that after sliding the button to the right and releasing, you then had to *press* it on the next step, and I missed that. Easy to do. Thanks Phil. Sit by fire with paper and sudoku. Weather is grey: not promising for tennis unless it lets up. But... it does. Talk with Ian, then to sch. Pick up kids, who all seem eager; send off DB ahead and catch them up; pick up NP at N's and off we go, a b it faster this time as we arrive in good time. DNBP go off, E is sad not to be able to join in, so we watch. Talk to Heather. A few spots of rain; biscuits afterwards; kids ramp while I talk to someones grandmother who is selling her house in France. Slowly back: DNB ahead and we find them in the wood; P is slowing and wobbling. EP go in after; later E comes out and tries P's bike for a bit with my help. Then... turns, runs, falls, and grazes both knees, blood wells up, she is sad. Oh dear. Wail wail wail. Head home after that, and after a bit have to give P a lift and carry his bike. P is very quiet: his mode of becoming sad is not D's or E's or indeed almost anyone elses: he just is quiet. Back to N's. DNB trampoline; P wants to be inside and have food and is close to tears/bed; E gets plastered. Then goes out to tramp, but that doesn't work. I go off to see if Rick is playing football: he is. I have my tea and talk to him while he is goalie, when the action is at the far end. Who is playing? I ask. BAs, he replies, surprised. And I recognise a few: Andy Clark; 2 women, Rob Arthern. But not most of them. Back to kids; Nick back, talk allots. Drag kids away as it starts to rain, and as we come down St P's it becomes heavy, DB complaining bitterly but not cycling any faster. Back and sit by fire with cocoa. Dinner, M back. E bed. D reads quietly to himself (Asterix; Bob the Builder; from the big story book), so quietly that he gets to exceed his bedtime. Will he learn from that? Soir: brief wiki; email; stoat:Oreskes again; Civ. Drive D to sch; then with E to Willingham (berrycroft) to buy some bee stuff: mostly brood foundation (3 packs in total, some for N), but also new gloves, another wired excluder, and a pack of spacers. Total £62. On the way there (and back) E bops along to the Clash, should I stay or should I go. Next step is smoko, and after that experiment with driving into town, to park at Parkside. This works, but I don't care for driving into town. We go to the pool, but very rapidly E reaslises this is a mistake, because her scraped knees hurt when wet. So after 5-10 mins we get out again. To arj/cb1, then collect the dry cleaning (which takes a while, as I turn out my pockets looking for the ticket, which turns out to be at home), then to car and to Seymour road health centre for E's eye check. This is like an adult one except E has a card to point to the letters, but she manages to say some of them too! E is OK; we are advised to re-check after n years, where n might be 2, 4 or even 8. So, now its just past 2. What to do? Decide to try Lammas land playground (E flatly refuses to go for a nice walk along the river). And she plays around a bit, but the weather is poor and we are the only ones there! Its cold. Head off for Orchard: coffee and soup for me; hot choc for her. Then its time to pick up from school. Don't do a lot with my free pm: civ a bit, then make up enough frames to fill the spare (#3) hive. Vote for me! And I do. Traffic is light. Pick up D (help him tidy up k-nex); send him home; get happy E. Home ourselves. M is back, and a bit of new wood has turned up, but nothing else obvious: behind the scenes some electrics I gather. I'm feeling really rather wacked so rest while M cooks. Later, take old pooter apart with D, rescuing cd-rom, floppy, psu and one stick of memory; bit the rest. Baths for DE. I stoat: twice: Peisner's abstracts and JA's bets. M is on p/sch stuff and work, poor her. Listen to the news: Blur in again, but reduced (exit polls were exactly correct). We didn't retain our deposit :-( and I did OK (8-9%: 432 votes). HKR complains I let the tories in: I reply, tough, people vote Green not libdem for good reasons. Misc work, home 2, builders still there. Pick up E from M's and P from sch: D is at multi-S and going on to A+C, in "payment" for tuesdays (we didn't ask, they offered). So we have a quiet time until DN turn up. N brings over NP's sleeping bags for the sleepover and leaves me to it. M is off to a concert tonight (so at NNN) by Ilga and a teenage protege, so I get to bed the infants but they are no trouble. 2005/05/07. Saturday. Sunny, cool, windy. Well I ended up staying up till 1 am Civ'ing last night, which is silly, but I still find Civ rather addictive. Bad me. Up 9: builders are here and doing stuff on the roof. I had wanted to do PP stuff today, but it seems I need to go into town: to get Ma a cake, and a present (photos, mostly from summer hols) and a new printer cartridge. So I do, and have a coffee in cb1 waiting for the 1h photos to be printed. Home. Lunch. With DE upstairs watching Bill the roofer flaming. Drag them away to pool, meeting BGSAC there, and we have a good swim (though D would still like to go to parkside). After, CB are off to London, and I take DEN to the sailing club, since its the open day. N is more interested than DE and keen to have a sail: they have some of the larger boats out so they both get a go. 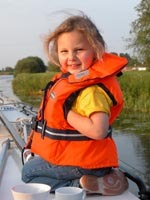 E puts on life jacket then wimps out at last moment so I stay with her on the bank. Its very windy. We all have tea-squash-cakes, play hide and seek, and head home. Intend dropping N but NN are out: N(elson) says they are car buying, or looking, so hang around a bit (E bounces, I sit in warm greenhouse sudoku'ing) then leave a note and go home for dinner (pizza). N arrives for N at 6:45 and she goes; quietly thereafter: M reads/translates Lucky Luck Painful Gulch to D for bedtime. Soir: misc webby stuff and... a bit of civ. M online too, writing her Claudius presentation. I go to bed after civ'ing at midnight: M crawls in at what I later discover is quarter to 4! 2005/05/08. Sunday. Sun, cool, showers (hail). Half expecting a roofer to wake us, but no. Noises off, up 9, quick b'fast then tidying in expectation of Ma. Sadly the l'room has gone a long way down so a lot of cleaning is required. Break 10 for coffee; stop at 11 to go off and collect some PP forms. Back to it, finally halted by Ma arriving a bit early: phew. Of course she is too kind to comment on the mess. So: misc. Lunch is booked for 1:30 at the pub: we were the second booking when I did it on friday and I nearly didn't bother. But when we get there only our table is empty: they are doing well. Since it was showery, MED drove and Ma and I walked, mostly at her insitagation. Several hailstorms and showers earlier: its a convective day. Lunch good, children ditto, though Ma thought her lamb a bit tough. Going back E decides to walk with us and does. We stop to see the allot first, and pick spinach which is growing well. Home just before another storm. I do some backup of Ma's satellite, she has some odd intermittent boot problem so is worried, but who knows. M has been sleepy all day and finally flakes out about 4 and crawls off to bed. We have a'noon b'day cake for Ma with 7 candles without her. Happy 71st to Ma: she is having no more b'days it seems. Talk about the extension and stuff. Later dinner (which M must have helped with, so have I got the order wrong here?... anyway, who cares exactly), E's bedtime is suddenly on us and Ma's going time just after. E comes into our bed again in the middle of the night, which is cute but too frequent and not good for our sleeping. Kids school. Mollie has had a hairdo and is glossy (she is a dog, of course). Work: Sharp / Yoga / AJs thinclient; hadgem ppn. Home 6:30. Misc. Soir: Civ; brief wiki; review tomorrows talk; mail; stoat; skype (test123 works; calling M doesn't). M pianos, works and does some "urgent" pre school stuff. Her talk that she spent so long preparing went well today. She gets to bed pre-11. To Hills Road Six Form College at 1 to re-give my "cafe scientifique" cl ch talk, at the invitation of Anna Hall (familiar feel of school from my days, except its mixed, so you gets students snogging in the corridors). It goes well: good questions. 18 present, and Anna says this is good for phys soc. Now its 2. What? to cb1. Then back to sch for 3:30: in theory N is taking E too to tennis (under some protest) but I want to ask E, who (to my surprise) says she would rather stay with me. OK: that makes it easy for N. Stay till 4, E playing. Home via BW, meeting SoBtB who says roofer on thurs (perhaps) and insul is walls. Home, leave E inside and "do" bees: main hive OK, lots of new, not granulating at all yet, some but not much capped. New gloves feel lovely. Swarm hive is not so great: busy yes, new brood yes, but in the super. Oops. Put one super selected at random under the queen excluder and hope. Main hive: there was a birds nest under the eaves at the top! The cutest little white-with-red-spots eggs, about 8. Xfer them to a bird box and hope. Get DEB at 5:30, talk with N misc. Soir: out 7:30 to PP meeting at which we all bring in our questionnaires. Happily Diana Bray has agreed to data-entry them, so apart from a brief discussion of what to do with the text comments (do those after) there isn't a lot to say, so back home by 8:30. Waste much of the rest of the evening on Civ, and some on wiki. Useful bit is stoat: on the talk today. Lunch at work with Todd/Tom/JCK/AJen. Misc work then home. Sparks is back at work fixing in a few sockets. He knocks off (forgetting to turn off his radio: shades of the penguin) just before I go to school. I don't need to: N will pick up E: but I'm free, its sunny and blowy so I can. Sit on the wall, watch the happy kids, pick up E from M'a and pass her along to N (DN in multi sports of course). Talk to Ian, who happens by: more roof expected this weekend; discuss Party Walls and Mrs B.
Laze in bed late, since I can. DE up early - in to us around 7:30, want this and that and can we have the TV on? No, apart from anything else its in F's room. Up past 10. Leisurely breakfast, D and I steal toast off each other. The plan for today is for us all to go out to leave M to practice, so just before 12 we do, all squeezing into our car (F in front, MJDE in back) and we wave bye to M. E is in her lovely new skirt and top, from F of course, and wellies. We are to Cogges farm museum, near Whitney. I'm not quite sure why I want to go to a farm museum, but I don't mind, and the kids are quite delightful at the moment so I don't even try to stay back with M. There is some pain getting there - the marked route on the leaflet leads us through Whitney, which is v slow and unpleasant - and then the car park is gratuitously mis-signposted and leads us to drive up a non-road track for a bit before a local points out our error and we reverse. So I drop the others off and drive round the True Path. Once inside (not cheap: £4.40 for me) there are various things. They are watching a sheep-shearing, which I find fascinating, but then DE wander off to look at the spinning etc. I find that a bit odd - the spinning is interesting too but sheep-shearing, with the struggling sheep and the clippers and the fleece gently falling off, is more so. To me. But the spinning is done by some nice older ladies, and they explain to D how it is done, and the carding and stuff, and he is very interested, and comes back several times, and even has a go at helping - there is a special hand-machine (japanese) for winding spun wool into a nice ball. Then there is some egg-finding. It turns out (J asks them) that shearing sheep is a net cost: a fleece goes for about £0.60 p (if its in good shape) but it costs more than that to shear them. But you have to shear them or they get too hot. And thats how the modern world goes... Sit in bit of talk (slide show!) that JEF are in, about the history of the Cotswold sheep. When the lady giving it taps her stick on the ground, someone changes the slide, but E thinks its by magic. Lunch: a bit odd, because food is rather limited, partly cos its 2:30 not 1:30 as my watch stopped. So, soup and sandwiches and not-so-good coffee. 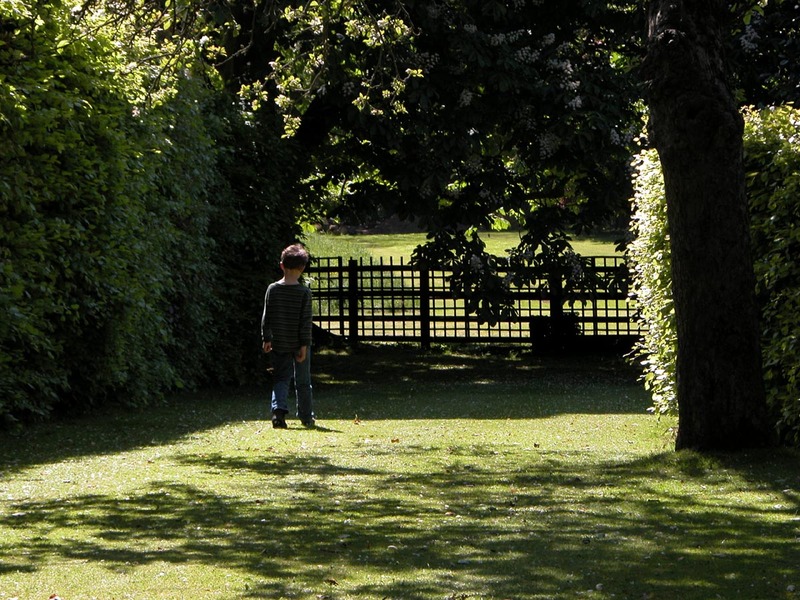 D doesn't really eat but plays outside in the playground while we eat, D drinking the can of Lilt I let him have. D and I fin first so we head back. We have, just about, done most of the things, its not such a big place, though there are a few random bits of machinery, some ducklings etc to see. We go through the walled orchard (now picnic) down cute paths to the river Windrush, and walk along. They have done the paths to the river very well - meandering through meadows - but haven't cut a path down to the river - H+S probably, don't want to encourage, etc - which is a bit sad. D forges down anyway and gets a bit stung for his pains. Walk back in big circle and find others. Its nearly milking time: watch this: takes maybe 20 mins to empty the cow (which has a calf too). I've never seen this before, jetts of milk squirting out. What do they do with it? Leave it to settle, skim off the cream (and make butter from it) then give the skimmed milk to the pigs. But... of course they can't sell the butter (H+S tedium) so have to bin it :-(. Sad. Now its 4:30: time to go: go back the other way (one track road) with CD3 of LoTR on, at Rivendell. I don't think it works as well, as a re-enactment, as it did in the Hobbit as a telling. Too bombastic: people can't really *say* many of the things written. Back: M welcomes us in. Early baths for DE so we can have dinner in time to watch Doctor Who! Which D is v keen to. We all watch. Its one of the tedious go-back-in-time-to-save/kill-your-father type stories, with a twist that strange monsters are turning up to kill people on the wrong branch. Well. Soir: finish Civ, write, bed. 2005/05/15. Sunday. M's piano. Lovely day. Up late again, in fact by this time D is out with Mfd to the playground. Sit outside with coffee - again its sunny, but today not windy and hence rather nice and warm. About 12, everyone else off to town for lunch, meeting Si+B. M and I will drive in separately, M asking me to stay with her, so we get a quiet lunch at home. get in about 2:30, park in M'len college school just nearby, as we get out find others there. Into Hildas, which presents a particularly attractive appearence - v quiet (where are all the students? ), green lawns down to the river, punts, cricket fields and M'len tower beyond. Find Ma drinking coffee on the lawns a bit further. With M, check we know where the building is (OK) and where we are in the schedule (ages to go) so we can relax. Kids run around, we chat, etc. Back 10:30. Just time for webbing and RC post on dimming (forgetting title - argh - but Gavin fixes it for me). Bed past 12. Work / Yoga / Directors talk / EWW: Cache talk / W. Home about 6. Out 7:30 to PC planning meeting, we all agree is near pointless, since the only action is to vote "no comment" on a planning application. Hey ho. Home: wiki: good: rfa finally starting to resolve, and (better) articles starting to stabalise. Misc posts of OD.net. Stoat on sudoku and funding. Which brings me back to the directors talk. Slightly hard to interpret exactly, but the general gist was that budgets are going to get very tight. Oh great. 2005/05/17. Tuesday. Sun, but cool out of it. Work (feeling a bit sleepy), home 2. Go look at bees, decide to take off the 3 supers from main hive. Do so: top one OK, lower two a bit harder, all starting to granulate... not a moment too soon! Leave them inside for later. Sch 3:30. Pick up DEPNB. P sad: in tears (I've never seen him thus): bicycle troubles. To N's: set DNB on ahead: P and E sit on my bike, off we go. Tennis: all goes well. I get to do a sudoku: Clare comes past with Stan to watch, and there is a small-kids informal play on an empty court, E with S. Nikola stops by too, both she and Clare are carefully cnsidering whether its worth doing the paid sessions after half-term. Whereas I consider its a good deal, but if NB drop out, D might be less keen? Hmmm. Cycle back: N takes P as far as the woods, then leaves us. Kids head in at a nnew place, the corner, and get into the field beyond, now long grass, long enough for them to play hide-and-seek when they lie down in it. So thats lots of fun. Call them back around 5:30 - time to head back, sorry. Poor D is then dragged past an interesting combine harvester type thing about to start up (or not: they are standing around it talking): N is not interested at all, B a bit. Back to N's, stop to talk a bit, DNB on the rec. 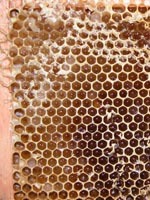 Go look at honey extractor: doesn't need a clean. Home: past 6. M just back (from interview: Frontier Silicon). Leave kids with her and take car to collect extactor, this only takes a few mins. Back home, dinner turns into pan bread, ie slow, so after some cornfalkes for the kids, me hoovering up, then getting annoyed with D for asking me "when are we doing the extracting" when the answer is "when I've finished cleaning up your mess, like I have to do every day, its very boring, why don't you make less mess", we actually have fun doing the extracting. There is less granulation than I'd feared, and most comes out, and since there is little capping its really quite easy and unmessy. Get through the 3 supers in about 1 hour, with a bit of help from D, and even E gets up on a stool to help turn the handle. Leave it to settle o'night. Soir: misc. Wiki my thoughts on experts, take 1 ish. Stoat on honey and RP. 2005/05/18. Wednesday. Warm and sunny. D to sch; E and I burble a bit: I've brought a dahlia and leave it there, and cut back a bush putting it into Ians bin (having asked him... also quizzed him on progress). Back with E; misc the smoko then Germ/Swim/Arj/Cafe-de-Paris/Lib/M+S(underpants)/Back. So that was all very pleasant and as usual (except cb1 closed, so to CdP). And i don't often buy underpants... not often enough, some might say! DE are to O/N's for the afternoon, and Joanna takes them, while I sit on the wall and enjoy the sun. Ian reports on plans-for-progess (next week). Home. Tidy a bit, then setup honey to bottle, realise it needs a second filter so that slows stuff down a bit. MED back 6:30, but DE seem to be camping in the car! After E's bed D helps with bottling a bit. 17 lbs so far. Soir: misc computations, update EGP website, now for more bottling... past midnight... 30lbs total. 2005/05/19. Thursday. Rain, not too bad. Work; talk (a bit long) by Ed Andreas on boundary layer stuff. Start up various fallen over runs. Then... rain. To town (and on the way I ***saw a weasel***, the first for ages. 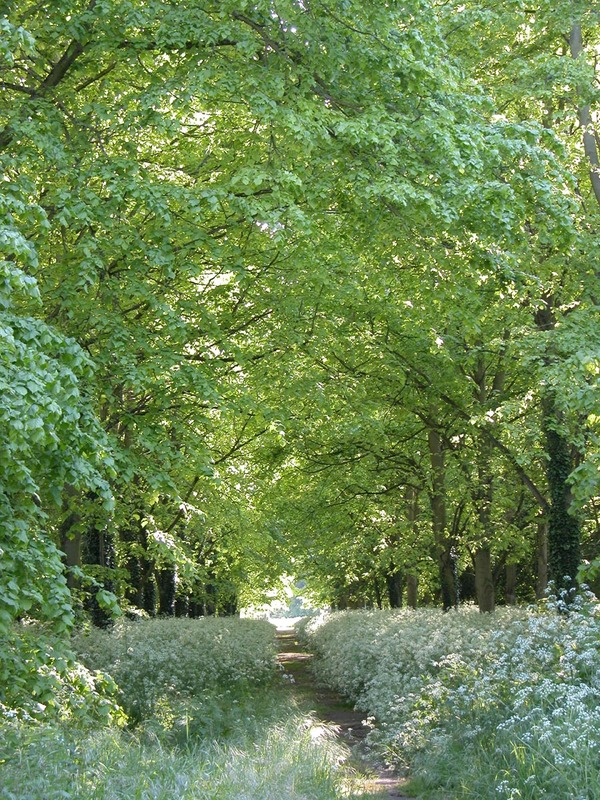 It was on the road to the Cavendish, where there is field to the right. It ran across the road (going from Madingley rd side to field), stopped on the edge, looked at me for a second, then went through the fence. I stopped, went back, stood in the field for a minute then saw it running away from me, in a bounding fashion through the grass), Heffers for lunch (singularity sky) then Borders (find a New Humanist). Home about 5. Read G2, nothing much. Pick up D then E; cook (getting a bit carried away: pasta for them, pots and aub for us, except when it comes to it neither of us is v hungry. Sigh. And there is still mondays kedgeree left). E a bit sad by bedtime, partly cos I'm tidying and M is in near-vid-game mode by the fire with a sudoku. D gets enthusistic and he stays up till 9 doing one with my help, while M baths. He can pretty well do it, if given suggestions as to which 3x3 to look at and what number, and can sometimes do some all by himself. I ask him about the one he took to school and he says, a bit wistfully, that the older friend he was going to do it with got bored. Soir: webby stuff: create wiki:AWS and some others, else quiet. M plays piano, perhaps for pleasure, now pressure is off. Bed *early*, sort of, ie just after 11. 2005/05/20. Friday. Fine then rain late. Wake early in sun. Builders at 8. Nearly late to sch but not quite - E late having b'fast so leave M to take her and go with D. Still take him to classroom though there is no need at all: sometime I'm going to have to stop doing this. Work: another talk (tides and heinrich; perhaps a bit speculative). Stop off on way back on FP to check where the new post needs to go and where the old one is: find this OK, say hello to cows and sheep, a nice walk. Home, builders still at work (good!). Misc. Pick up E from M'a and P from sch. E wants to play out; P wants to play on the computer, so I let him. Quiet. Sudoku from todays paper: hmm, quite diff. Get ND after multi sports. Wash up. Start cook. M back just before 6 so leave it to her and retreat to Sudoku, then come back and help later. N collect 7, by which time its pouring with rain. Soir misc online. Wikipeace, at least nearly. To town sans b'fast, get it at Heffers, where I nearly finish Singularity sky: quite good, but common IMB type problem: excess powers. This lasts till 12 when I really ought to go. Its raining. Wait 5 mins, OK, to Ox, then back, then it *really* rains an I get quite wet. Home, and towel self dry and spread coat to dry and find wet wallet. Etc. D is on pooter; E misc, M tired. What to do? DE want to swim, Parkside? OK. Not cycle in (still raining) so risk car. Several car parks full but happy not Queen Anne (p'side) so OK. And its good, E even ends up doing a bit of "swimming". D gets to go on the flumes, twice, and really enjoys it; but is thwarted in his desire for #3 when they shut. E is just a bit too small to go with me on a double. After: cb1, where they are both good; briefly arj then germ toy shop. Woman looks a bit grumpy, perhaps, but custom is thin. Back to car and back to home. Then out again: to springwell apiaries (ie, John Rayner) to collect jars, 2 gross. Get off M11 too early (not Dux mus jn, next one) then OK. Nice chap, good chat, his prices for foundation are good too. Then... nightmare on way back, since turn wrong way on M11 and end up going 16 miles to Standstead then back. Argh. Drop 1 gross with Simon, say hello to George and Maddie (but they don't say hello back...) then home just before 8, to cold-but-nice pizza etc. Get a lie in, then up. Tidy, b'fast with DE. Coffee for a rest, then set out to tidy outside. Cut grass front and back, mostly. Stop for lunch. Jo brings SW round, chat. 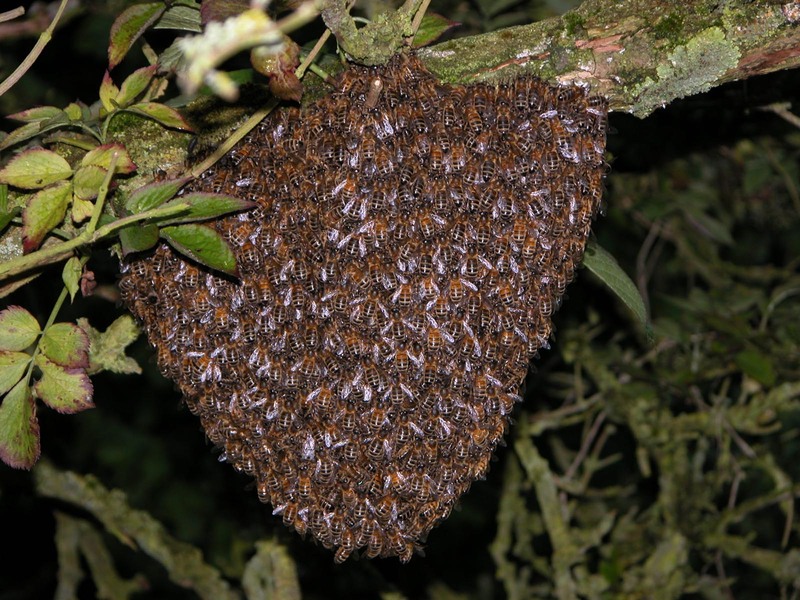 Take a look into "spare" hive since it has an awaful lot of bees in/around it. Can't quite work out what is going on. most of those inside are at the top, and seem to be despoiting (not taking excess) honey. No sign of queen/brood. Hmm, I'm confused, so leave it. Use cast-off roofing tar/felt to patch holes in two ex-water tanks that SE left me - this seems to work OK and isn't as hard as I expected. D watches. Lug them into the car, and the extractor, and the new waymark post. Persuade D along: he is lego-ing and needs some persuasion but also needs to get out somewhat. First drop extractor with N: N has friends round so don't invite her. Put tanks at back of allot where roof will fill them (I hope) - really needs a gutter. Then to start of FP, near bin brook (all the while listening to LoTR, we're on the 2towers, edoras). D plays in stream a bit while I get stuff out, then off we go, me with post, him with spade. Push through herd of cows and a rather bold sheep, its very pleasant and green and spring, though with M11 noise. Find sopt; dig holes as best I can and put in post, hammer, and refill and hammer. GK has a "drift" I could have borrowed but lets see if this will do, if not I'll come back with said drift. As we head back rain slowly starts then winds up... to pub (I gave D choice of pub or orchard). Now its 4. Summer lightning for me, lime-and-soda for D, and peanuts (no twiglets :-(). M'a etc come in, so I get to ask Jodie if she can b'sit this weds. Yes. So we *can* go to the beer fest. As we're in the pub, rain hammers down, so after to the allot to check the water tanks... not a lot so far. It does need a gutter. Home. M is cooking. Finish grass cutting (which is now v wet of course). Builders bits need a tidy: must speak to Ian. Food, then after baths for kids, the bl**dy pilot light went out again so water cool, this is getting a bit much. 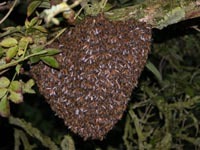 D wants bonfire, so collect up some wood and take it down, and notice... a swarm of bees! Aha. Not huge, but OK, phone N, get Nick. He comes over, cool and unflappable, and collects it rather well, using a brush to brush them off the branch, and patiently waits (gentle rain starts) for the last few stragglers. Then I tape it up, and off he goes: good luck. Inside. Wiki (grrr), mail. Fill in PP questionnaire (belatedly), realise I don't have elec expense forms, oops, mail for them. W / Y / W, leave 6. Having asked Mr-will-be-anonymous for advice, try to fix the pilot light that keeps blowing out on the boiler (its getting silly now and not lasting a day). Step 1 (always the hardest) is to get the cover off: it needs to be unscrewed, then pulled out a bit, then swung from the bottom a bit, then lifted. OK. Clean near light with toothbrush - awkward. Reassemble, its worse than ever. Argh. Thinks... try again, but this time remove the manifold/protection around the jet. Ah: now I can get to it, and see the gunk building up, and clean it. Reassemble: better: visibly larger flame, that actually touches the thermistor, and! it stays lit. Hurrah. D has made some more rather nice "stained glass" stuff. Work till time to pick up E: sea ice ancils again. Get E, talk to Ian re house, D off with N to tennis. Back home, E quiet, sit ouside. E cuts finger, so inside for plaster and cuddles and story time. Eventually N finds us lying down by the fire, so I get up to talk about PC plotting. Cook pasta/broccoli, M back just after 6. I'm tired. 7: off to PC meeting, lasts till past 10, but it is the annual one. Ross prop GK for chair, no sec, falls. N prop me for vice, no sec, falls. So we're back to the same old faces. Apart from that, and being too long due to rambling, OK. Since E has hurt her hand, skip swimming (she is sensitive about this since her knee). The builders are building (well, when we leave for smoko, they are having their tea break, but in principle they are working...). Town (finding the footpath closed, so diverting through the Cavendish. Stupidly, they have shut the end near we normally go through, so the diversion is longer than it has to be). Germ cafe, lib, arj/cb1 (nearly CdP but at last minute E agrees she likes CB1). Then Handle Shop in Drakes (recommended by Ian) and E has fun. What a lot there are. Then realise I've forgotten JQ... oops, phone, but he is out. Heffers for D's glass paints, which he is really keen on, and for some reason we're buying not him. £2/tube: black (leading) and brown. Soir: Jodie arrives on time and we head off for the Beer Festival, arriving at about 8 just as A+S turn up. A jumps the q, being camra, and S stays with us. Inside buy glasses and find C+A and -gasp- Dinan, the father-to-be. And go get some cider. And it ends up a good evening, sitting outside and drinking. S & I talk some politics, general, organistaional. A has a new toy, a photo-displayer with 40G disk: doesn't seem that useful to me. Back somewhat past 11; M takes J home. Again, building noises early. DE sch; work, setting off C20C/seaice type runs with CO2 forcing. After, to town, meeting JQ at 1 to get his expense form signed. Chat for an hour over coffee, which is maybe longer than it should be. After to Ox, then read SS at W'stones, but I'm skipping, its become generic. Homewards. Stop at allot to pull up a few weeds - more needed. Then home, wiki (sane for the moment), sit out in sun with paper and RoG on Heinrich. Add a stub Heinrich events article. Mr Box comes round, ok, but I cancel next weeks. Then its time to get D and E. Discuss HP with D on the way back: he is keen to read the books. Penny phoned us: phone back: its about the bit-of-land-at-the-back over the stream: sold, apparently. To whom? Cook: pots, aub, sos: good. M back 6:15. Me out 7:30 to gov finance meeting but nothing much: drags out to 45 mins though. Soir: M out for a while getting cheques signed. I update school web (Mrs Leepers page) and PP (last 2 sets of mins from Stu). Note through the door: M'a sick (or does she just want a long weekend?). Sigh. Work, briefly, then back by 12 to pick up E from p/school. Its hot hot hot! Where to go? Home (via talk with G at BW). Misc. Decide to go to orchard pm to get some flowers for the front to beautify the foot of the plum tree: normally I wouldn't bother but it helps to balance the disastrous state of the rest, partly because of the building. Choose some yellow/orange marigolds, a joint decision but with consistency by me. As we wend homewards, E sees the car, so it must be M, so we follow her home. A little while later I take E to school, since De are going to Adams from after multisports (D because Helen wants A to do something other than play football: either because D is considered more cerebral, or because he merely won't play football). E is happy to go play with Viv; and Paula takes them all. Stoat on the CCC climate document. Wiki: arbcomm case is now formally the cl ch dispute, which is good. 2005/05/28. Saturday. Sunny, cooler, windy. Up late, just in time to talk to BtB, who has come round to smooth over the limestone (and skip) trubble. 11: off to allot to cut grass. Mower in car (lazy) at same time as ME go off to w'rose. Take 2 jars honey to fresh produce stall (first of the year) and D and Cory have cycled down. ME off, I take mower in. DC go off to N's (she is out, off to Germany, but N lets them use the trampoline) while I set to cutting the grass, which takes an hour. Hot in the strong sun. DC back, and to keep them occupied I let them bash up some old fencing (Ben and Sophie are having their back fencing renewed, by what turns out to be a Czech who can speak v little english: but yes, its junk, so turn them loose). They have fun with this while I plant out three courgettes I bought from the stall. then it turns out that one bit shouldn't have been bashed: oops. Never mind, B+S will get a new gate too! Then to the pub for a drink, and DC play pool (or their version of). ME come back just as they are finishing, while I'm talking to Tim (and a chap called Richard). This is proper village pub stuff: going in without your mates but finding someone anyway. We go home, and I follow up by cutting the field at the back and some of the lawn. Then a quick bath, and get out at 14:25 because I realise its time to take E to Gemmas party. And I do (E requests me: she likes us both, she says, but I am the person who takes her to things). Meanwhile B comes round to us. E wears her best party frock, new from F.
M goes off to get present for Olivia tomorrow, and I have DB then DakC to try to keep happy. They split, after a bit, into DC and DakB, the former quiet, the latter not, and argue somewhat. I throw them outside, and threaten to send CDak home. In the end 4:30 intervenes and we set off to get E after G's party. All there happy, though a bit shattered as one usually is after such things. I hang around till about 6, sicne D has been invited over and E's status is unclear. I bowl for BDakC who want to play cricket, and even get D out for a bit. But at 6 Andy offers to keep them both for supper and Dr Who, and invites me to watch. So home, and hours peace (or it would have been only I stopped to talk over the bit-of-land-behind, with Tony, which turns out to have been sold to the CPS I think, and they thing maybe). Back for Dr Who, and to my surprise M comes too. It turns out to be part II (the empty child) and is reasonably good: not totally logically coherent, but nonetheless exciting, scary, well done and hangs together. Fin 7:40 hence E back past her bedtime and wants to eat so bed late. I wash up and hoover while M beds E and D looks up Dr Who on the web. Then... soir: sit out till past 9 reading Dialogue...: its lovely out, birds and greenery though a bit cool. Come in and wiki (little); then this then bed. My day to get up, which I do at 9. Quiet morning. I strim quite a bit of the wilder portions of the back garden (getting bee stung once for my pains). This leaves me covered with bits of plant, strimming is a messy process. M to bed past 12, sudoku taking its toll on her, she sits on the loo in the bathroom to finish one. A bit annoying. 2005/05/30. Monday. Mostly sun, a bit of rain. A day at home. C/Dak come round in the morning but are reasonably restrained: nonetheless I tell them not to come back till about 5 in the afternoon so we can get some peace. Make bread at D's req, and he plaits a loaf. I find time to write abstract 2 (EVP) for NZ. D is spending quite a bit of his time reading HP&tPS, and I won't tell him who gave him the invisibility cloak and stuff. He asks Dak, who knows the series I think. More strimming, finishing the bits nearer the house, then a bit over the stream: the path there is nearly closing up, and will in a year or two. Rumours that the CPS have bought the land from the Silks. JE run round with friends for D: they end up coming in for a bit. I then take E off to deliver G's present (not quite sure what it was, E not sure either, but M now says it was "zoobs"). BGS are off with their grandma but CA let us in to see G's newly pink-painted room. Its a bit vibrant. E, at least, doesn't strongly press for one like it. When I get back D is off to JEs house, which is OK by me. Its developed into a calm warm mellow late-pm. Gold sunlight, green world. Our garden is very tree-ish at the moment, in fact perhaps too tree-ish, we must consider some drastic pruning of the willows at least (or bending them into the tunnel they were supposed to become). When I next look, D is playing football (!) on S'dale green with JE, their two friends, C/Dak and Bram. Bram is losing. On the sidelines, young Martha and Anna are playing with leaves. All rather idyllic, so I watch and appreciate. Brams losses get too severe: I am called onto their team. But when the match ends (CDak need to leave at 6) we're still losing. D was goalie in the winning team. Home; dinner: M heats the pizza while I tidy outside. Soir: online. Start on the NH article. Lots of building work - see blog. Much consultation and progress. M to work, E to M'a (latish) and I at home with D.
Head off to smoko before realising... its a priv day! Oops. There will be no-one there. Ahem. So... since we're still in the village, divert to N's to pick up the Pink Panther video which D has wheedled for the trip. Coffee at home instead. D is still reading HP intensively. We do the grauniad sudoku, which is an easy today, or rather I help D. with most filled I leave him but! There is some error. Take it onto the boat to fix. From 2 to 3:30 I pack and D plays with JE and two of their friends: Rebecca and another. All v well behaved upstairs, except I am afraid to say for D who is showing away somewhat, at least when I'm around. So I go back to packing. 4:10: M arrives, we finish stowing, a few minor Q's to Andrew, and we're off. So suddenly that I forget to check properly if the car is parked OK and, oh, something else. Anyway, we're off, chug chug quietly up the river. Sun. No eights. Andrew says that means the bumps may be starting tomorrow in which case we'll be coming back through them, ha ha. But the river continues quiet. Fairly soon DE disappear down to PP (M works out how to turn it and the generator on) and I get to do most of the steering which is fine. M brings me coffee and tortillas. Baits bite lock and everyone is turned onto deck. I stuff up the approach to the stage (its quite windy) and have to turn and return. Otherwise OK. D helps with the lock controls (I realise after that it says no-u16, ahem) and we agree that one that you can push by hand like at Ma's is more fun. Dinner (pasta) at the stage just downstream of the Waterbeach lock. Then continue onwards, a bit faster now. See a ?barn owl? hunting over a strip of coarse field. Clearly an owl, probably barn, the large face clearly visible. Slowly hunts down, then back up again, then down. Only disappears when I get the camera out! Past 8: stop at the Fodder Fen goba mooring. 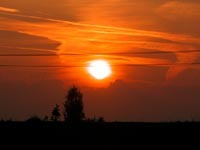 The a1123 is just a bit further up, but its quiet now, and there is a beautiful view of the sunset which is fiery/bloody. Good photos, except for the phone wires in the way, and photoshop will solve that... There is one other boat here, Bluebell, and she is quiet. Kids late to settle, of course. I sit out with a coffee and Weart. It is quiet, bar the occaisional car, and not a sniffle from Bluebell.